Rabbit health issues are a mixed assortment and rabbits are at risk to various infectious diseases and other health problems. Some are well documented, whilst others are not so. Many will know that a pet rabbit should be vaccinated against myxomatosis, but they may not know that a rabbit should also be vaccinated for the viral haemorrhagic disease (VHD). It is also surprising how little awareness is given to GI Stasis, a potential silent and deadly killer, caused when food matter, or lodged hair, in a rabbit's digestive system ceases to move through the intestinal tract. Rabbits do not show outward signs of pain and your rabbit may be unwell for a while before you realise. A change in the rabbit's behaviour is always a good indicator something is wrong. If the rabbit seems lethargic, listless, not moving, not eating or not producing droppings, then you should be concerned and act immediately. 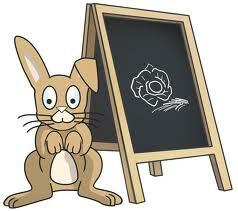 Dental disease or teeth problems are common, if the rabbit is not given the correct care or diet. In addition, there are long term problems, such as a high cancer risk in does, if a rabbit is not spayed. GI Stasis - silent deadly killer, blockage of intestinal tract. Dental problems / Rabbit teeth - dental disease/teeth problems- rabbit finds difficulty in eating or stops altogether. Flystrike - urine staining or droppings around rabbit's rear end attracts flies which lay eggs. Fur mites - Rabbit itching, patchy fur, fur having a dandruff effect. Internal parasites -treatment against worms or fleas. Rabbit diarrhoea - Find out what is causing your rabbit's diarrhoea and correct the problem. It may be helpful to add that certain breeds of rabbit are more prone to particular inherited disorders. These details can be found on our rabbit breeds pages. In addition to being aware of the potential problems you should, make sure your rabbit is spayed or neutered, read our ' feeding your rabbit ' page for information on diet and have the rabbit vaccinated for myxomatosis and viral haemorrhagic disease (VHD). As a footnote, when referring to rabbits being spayed or neutered, it is assumed there is no intention to breed the rabbit. Unless you are a rabbit breeder, hobbyist or show breeder, the implications should be seriously considered before attempting any breeding and also seek expert advice regarding this matter.